I guess you could really say its just been a rather slow week in terms of news. Sure rosters were finalized on Tuesday night for the rest of the year and the league announced their big break next summer but other than that it’s been rather calm in Major League Soccer this week. I do have a couple thoughts and links tonight around the game. First up I did want to recap the notable moves that have taken place this summer in the league now that the rosters are frozen into place for the next couple months. This is also a good time to take part in the little poll to your right on this page about the best summer move in MLS. Go ahead and vote now if you haven’t already! Chivas USA and FC Dallas — Marcelo Saragosa to Chivas USA for Atiba Harris. 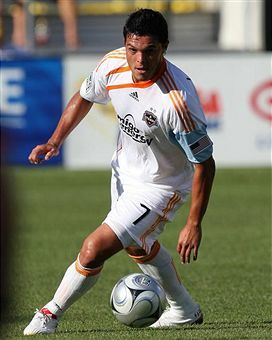 Jesus Padilla (F – Chivas USA) on loan from CD Guadalajara. A good counter point by Kartik over at the Kartik Report about some of the drawbacks of the league taking a two-week break during next year’s World Cup. Some points make total sense and show that the league really never needed to break during the World Cup in the past since it saw some slight attendance bumps during each World Cup. I do disagree a little on the point about the balanced schedule. Sure we want those regional rivalries to be as good and as intense as possible but we don’t want to water them down into nothing I think too. I thought the LA-Chivas rivalry was stupid at first when they played each other four or five times in a season. Now that it is down to two games I see some real intense matches between those two from here on out. I’m sure as the league expands we’ll get slightly back to rivals playing one another more than twice in a season though. Sounds like this time around for the U-20 World Cup the US had a tough time picking players since there weren’t many available playing in Europe. No Jozy Altidore this time, or Freddy Adu. In a way it sounds like US manager Thomas Rongen is just bitching a little about the lack of players making it in Europe right now with this squad. With more college players in this year’s squad I would imagine that if the US does as well as they did in Canada back in 2007 that we will see plenty of these guys abroad for years to come. Last link of the night is a good one folks. Jason Davis over at Match Fit USA has an interesting look at the character of clubs in MLS right now. He brings up a great point that the league is still rather young as we all know and it just takes time to build up a club’s character in it’s city with the local fans. Head over there and check out the article because it is worth a read. Isn't Jozy 19? Why can't he play for the U-20's? You're dead on about Rongen. He's already putting out excuses so he doesn't look bad if they go three and out. And yet, the USSF will continue to employ the clown. Isn’t Jozy 19? Why can’t he play for the U-20’s? To answer Kevin’s question….Because he doesn’t have to. In case you haven’t noticed, he’s a vital cog for the senior national team. You’re dead on about Rongen. He’s already putting out excuses so he doesn’t look bad if they go three and out. And yet, the USSF will continue to employ the clown.